Ran out of business cards a few months ago, but didn’t need a new batch until recently. Of course, rather than just going to the print shop and dictating my name, email and phone number like a person who has a life, I spent the weekend on the beach drawing ideas horribly on my moleskine. 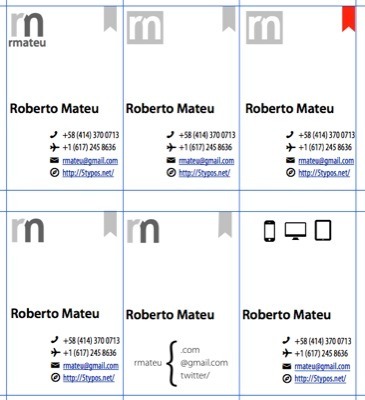 When the time came to put the palette to the pixel, I was left with a few variations of very typical business cards. I think these work fine when you’re a member of the formal employment sector and listing your name, job title and contact info is all the signaling needed. However, there’s a reason why freelancing translates to independent in spanish —the same word grandmothers here use for 30+ unmarried girls. With independent business cards, it doesn’t matter how much you spice up your job title, all everyone hears is unemployed. The challenge is that you don’t get to imprint your value to a potential client, and the business card is added to the pack. When I see a business card, I want to know three crucial things: (1) who the person is (2) what they do — why they are relevant to me (3) how I can contact them. The problem I face here, is how to say I do a little of everything geeky and still sound professional. To some, I just build websites. But my most enjoyable projects involve setting up a combination of web services and duct taping them to the clients workflow. And even after this, if asked, they’ll say: he does computer stuff. Insight, computer stuff, that’s what I do. Great, knowing who I am, check (at least on weekdays), what I do, check-ish, and… what’s this? how to contact me? where to start?. But if you take out a pathological need to show off my formidable web presence, a potential client most likely will only care for a place to see my work, and hopefully afterwards, my email and phone. Do yourself a favor and buy some great blank business card paper stock and keep a pen handy. When you meet someone, make them feel a little special by taking the time to write out exactly what they need to know. It’s unique. It stands out. It’s powerful. I still think this is brilliant, but my penmanship would make solving The DaVinci Code seem like an easy challenge compared to figuring out what I wrote. So I met the idea halfway, worst case, my email is readable. 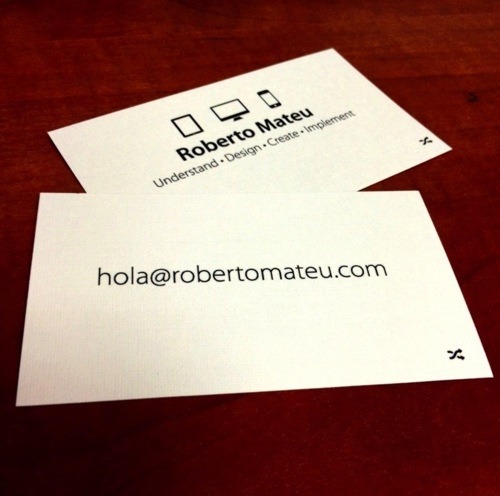 I can easily underline robertomateu.com (soon to be updated) to point to my site, and I can write down my phone number, twitter account, blog or even google voice number, making the card more special. Maybe I’m just a sucker, but when someone writes something on a business card, it seems to stay at the top of the pile. And the real benefit, is that I think it looks great. Because, you know, like, less is more, or something.